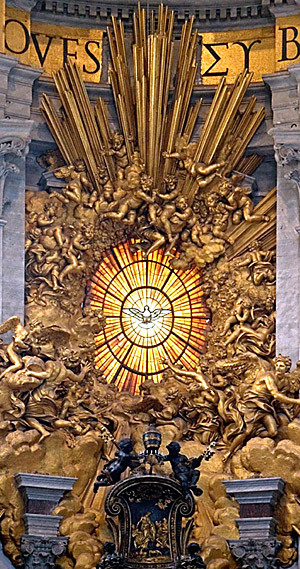 This Roman Catholic Beliefs study features images and information that proves that the Popes of Rome are Sun god Worshipers. 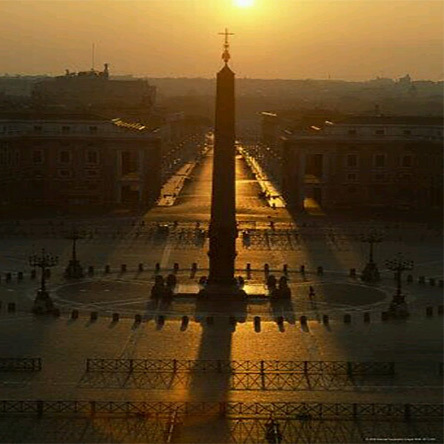 In the middle of St. Peter’s Square is an ancient Egyptian obelisk, which represents the Sun god Ra of Egypt. It was placed in the middle of a giant Sun wheel, which is lined up with the solar solstices and equinoxes. When an obelisk is placed in front of a temple, it designates it as a place of Sun worship. 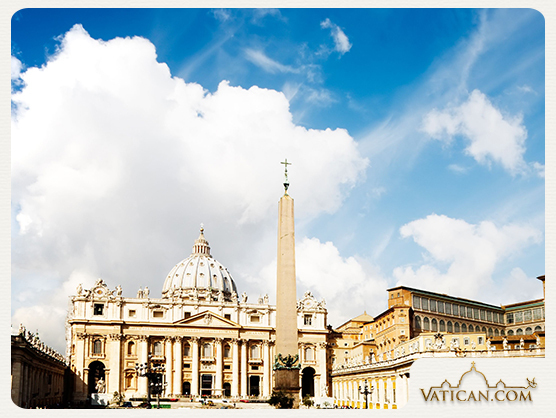 The Egyptian obelisk sits directly in front of St. Peter’s Basilica, designating it as a temple of Sun worship. The pagans believe that their Sun god is conceived on 3/21, the Spring Equinox. You can see this played out annually at the Vatican, when the rising Sun causes the shadow of the Egyptian obelisk (which is a phallic symbol representing Nimrod, the Sun god) to fall towards the dome of St. Peter’s Basilica (symbolizing the womb of the moon goddess Semiramus), representing their annual sexual union. Nine months later their son Tammuz is born. The cross on top of the obelisk actually is the letter t which represents the sun god Tammuz. The pagans believe that on the Winter solstice, 12/21, that the Sun god dies, as the Sun is at its furthest point away from the earth; that it is dead for three days, and then is reborn, so they celebrate his re-birth on 12/25. Tammuz, who was symbolically conceived at the Vatican on 3/21, is the reincarnation of the Sun god Nimrod. His birthday is celebrated on Christ-mass. Note: The Messiah of the Bible was conceived in December, on the Hanukkah (the festival of lights, as He is the light of the world); and He was born in the fall, on the Feast of Tabernacles. Christ-mass symbolically represents the birth of the Roman Sun god Sol Invictus; which points back to the Babylonian sun god Tammuz. St. Peter’s Basilica has a huge sun symbol behind the stage where the Pope sits. 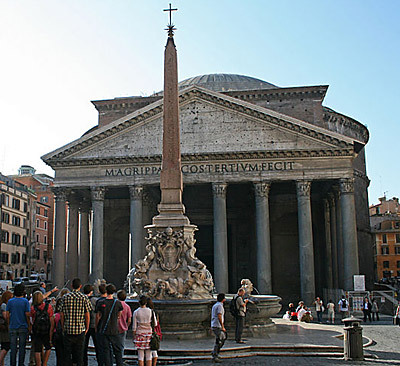 The Basilica of St. Mary and the Martyrs, used to be the Roman Pantheon which housed their pagan gods. It too has an Egyptian obelisk in front of it, designating it as a temple of Sun worship. The Catholic Mass is performed in a place that was built to worship all pagan gods. 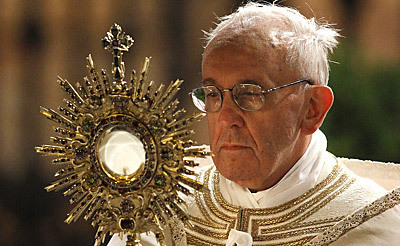 The Eucharist host wafer is round, representing the Sun god. They hold it up to revere it. Then they place it on a crescent moon (representing the female womb of the moon goddess), which represents their symbolic sexual union. This symbolically makes the wafer the flesh of their Sun god Tammuz. This is carried out every day, thousands of times a day throughout the world. 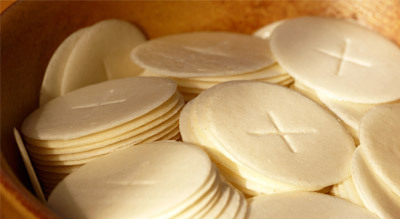 The Eucharist wafer has a t on it, which represents their Sun god Tammuz. 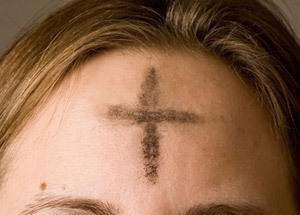 On Ash Wednesday, they mark the foreheads of Catholics with a t for Tammuz. The 40 days of Lent symbolizes the 40 years that Tammuz lived. Lent ends with Easter when it is tradition to eat ham. This symbolizes the remembrance of Tammuz, who was killed by a wild boar. 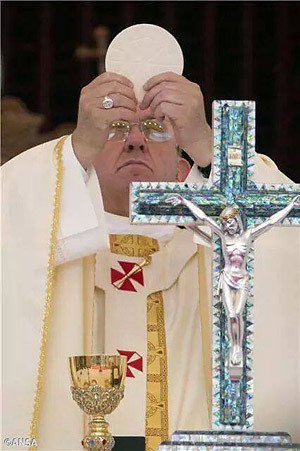 The top leaders of the Roman Catholic Church worship the Sun god of Babylon, which is ultimately Satan worship. They fulfill the prophecy of Mystery, Babylon the Great; as they worship the pagan gods of Babylon, under the guise of Christianity. And they cause innocent Catholics to unknowingly partake in these pagan rituals. In Revelation 18:4 Messiah told Catholics to come of out the Harlot Church before it’s too late. Worship the true Messiah of Scriptures, not the false one that was created by the Popes of Rome. Come out of Babylon!